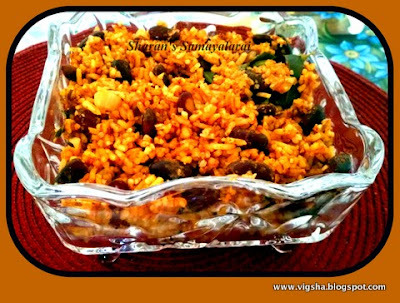 Rajma Pulao is a wholesome and tasty pulao which does not require any accompaniment. 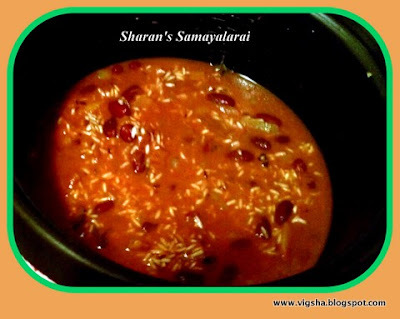 The rajma water gives the rice a beautiful pinkish brown colour. 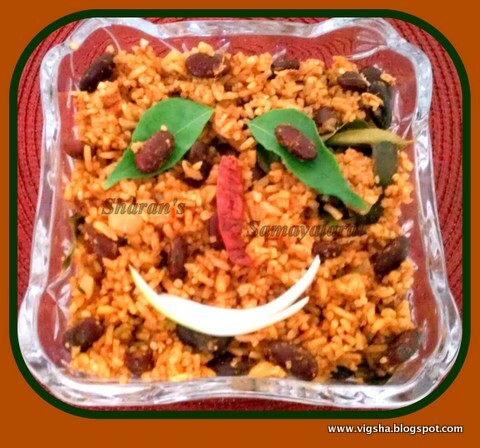 The kidney beans, cooked in onion tomato gravy with a blend of indian spices give the rice a very different and unique flavour and aroma. Rajma is a variety of Kidney beans and literally mean the "King Bean" which is high in protein, folate and mineral content. The high levels of magnesium provides added cardio vascular health benefits. 1). Soak the kidney beans overnight or soak in hot water for 3-4hours and cook them three fourth in a pressure cooker. 2). In a pan, add the oil/ghee. When it is hot add the whole spices (bay leaf, cloves, cinnamon and cardamoms), Once they start to spread the aroma add onions, curry leaves, ginger garlic paste and fry for 2minutes. 3). Add the tomato puree, turmeric powder, coriander powder, chilli powder, garam masala, salt and fry till the masala leaves oil. 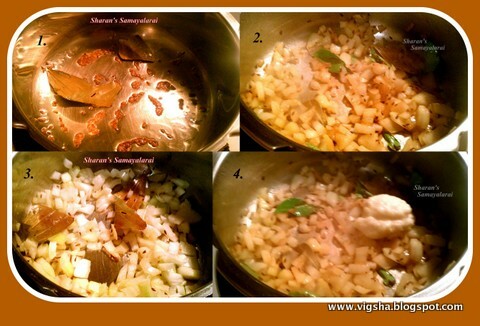 Add the cooked rajma and mix well. 4). Transfer the contents to a rice cooker. Add basmati rice and water. Mix salt as per taste. Allow it to cook. Garnish with cilantro and serve hot with raita. Simple and suitable for lunch boxes. Enjoy this finger licking dish! # Light brown Rajma beans will cook in less time (whistles) than the red rajma beans.Every Pressure cooker is different.Some may or may not take a longer time to cook the Rajma. 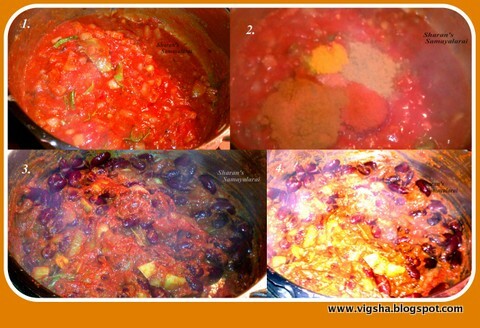 # If Rajma remains uncooked even afer cooking for long then you can try adding soda to it when soaked on previous night. # If you want to make rajma in a jiffy, you can get canned Red kidney beans from the store.Don't use the water they are soaked in as it has lot's of salt.Instead rinse it in fresh water and if the kidney beans do't look soft enough cook it in pressure cooker with enough water.